How are you supposed to talk to admission counselors—they might hold your whole college future in their hands!!! Luckily, they’re usually really nice, and it’s not that hard to chat with them in person or send them an email. Whether you meet them at a college fair, you’re asking a question over email, or you run into them during a campus tour, here are helpful tips for talking to and emailing college admission officers. 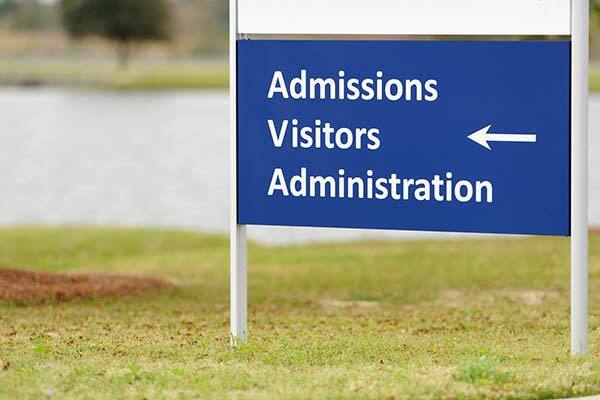 You’ll probably meet at least one admission rep during your junior and senior years of high school. You might see them at college fairs, campus visits, information sessions/panels, and more. And you’ll also be told you should take advantage of their smarts and ask them your questions about their college or university and your potential place in it. But just how are you supposed to talk to these admission reps anyway? Here’s how to tackle every interaction you may have with college admission counselors or other school representatives, from etiquette to handy reminders. So you give yourself the best shot you can at getting into your dream school. First, starting any sort of conversation with the reps at a college fair would be a step up from the average trinket-grabbing student. But to really make a good impression, shake their hand, make eye contact, and introduce yourself using your first and last name. But even though you should speak professionally, don’t feel like you need to be too restrained in conversation with them. College admission representatives are just as used to the kids who have been obviously taught what to say as they are to the kids who don’t make eye contact or really speak at all. So speak genuinely and be yourself. Do you have any legitimate questions about the program you’re interested in at their college? (You know, not “Do you have a marketing major?” because you could Google that in 30 seconds.) Ask them! Just keep in mind that other people will have questions too, so don’t monopolize their time with 102 super personal questions, especially if they have a busy table. Additionally, before you even get to the college fair, you should do research on the schools you’re interested in so your questions for the reps can be school specific. At the end of your conversation, take their business card so you can follow up with a thank-you email right away (that afternoon or the next day). Just like any social interaction, the little things can make all the difference. Although admission officers are friendly (you definitely need to be in their position!) and a lot of them are pretty young (many are recent college grads themselves! ), you still need to be formal when emailing them. After all, you want to show that you’re mature, articulate—and ready for college and the real world. You should end with a “Thank you,” or “Sincerely,” followed by your first and last name. You might want to include your phone number too, as well as any student identification number, if you have one. Finally, you should be polite—and never pushy—throughout your message! However, although your email should be on the formal side, it’s also a chance to develop a relationship with people who will eventually review your application. For instance, when I emailed a representative to change my application from Regular Decision to Early Action for the college I ended up attending, she happened to have the same name as me. I acknowledged our shared moniker briefly as I ended my first email to her, and she made a joke about it in response. I was actually on the lower end of the application pool in terms of GPA and ACT scores for that university, and although I’ll never know for sure, I can’t help but wonder if connecting with that one admission counselor helped secure my spot in their freshman class. Also, if you are ever unsure as to who you should email, many colleges have different admission officers for each region of the country. A brief Google search or quick phone call to the admission office can help you locate the representative responsible for communicating with applicants in your specific region. PS: Make sure you have an appropriate email address! If you don’t have a grown-up email already, your-name-plus-some-numbers@provider.com will always get the job done. Student representatives usually give campus tours, but if you interact with an admission counselor during your visit, most of the advice for talking to representatives at college fairs still applies. If you find you have a little more time to talk to the admission counselor, you might ask a few more of your well-research questions. If you’re going in for a legit admission interview, well, you should just follow this specific admission interview advice! Otherwise, campus visits may feel less personal because they usually happen in large groups. A great way to stand out in this situation is to send a handwritten thank-you note to whomever you interacted with most on the tour, be it a tour guide or someone who works in the admission office. A thank-you note is earnest and shows you took time out of your day to show your appreciation for the school. Overall it’s just a nice gesture, and it certainly can’t hurt. How do you typically talk to admission officers and representatives? Did you learn anything new or surprising? Did we miss any helpful tips?! Let us know by getting in touch.